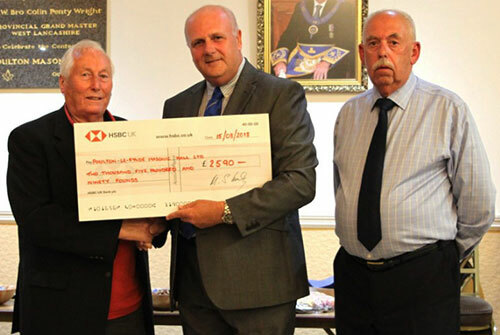 There was an informal celebration at Poulton Masonic Hall when over 70 people, including Freemasons, their wives, partners and friends, all gathered together to witness Assistant Provincial Grand Master David Winder presenting a cheque for the incredible sum of £2,590 to Stuart Sagar, Vice Chairman of the Poulton Masonic Hall Committee. Pictured from left to right, are: Stuart Sager, David Winder and Michael Lumby. Lodges and chapters meeting at Poulton were represented. Members of the ‘Light Blues Club’ from the Fylde area were also present as well as Blackpool and North Fylde Masons. Each year the brethren and companions who meet at the Poulton Masonic Hall receive a free diary which many people find useful. It contains a lot of information and is beneficial to all. This year Michael Lumby has spent a lot of time and effort in producing the diary for the 2018-19 Masonic season. He has increased the amount of advertising, which has helped with the costs. Poulton Masonic Hall have benefited from the profits of the diary. John Lee welcomed everyone present and introduced Michael Lumby, who explained how the money was raised. He then invited David Winder to address the gathering and to present the cheque to Stuart Sagar who responded with grateful thanks. During the evening there was complimentary wine and light refreshments for all. South Fylde Group Chairman Ian Ward and vice chairman John Robbie Porter quickly involved themselves by acting as waiters and helping to serve the refreshments, which were well received. There was a raffle, which was run on behalf of Trinity Hospice and a lot of prizes were brought on the night to be donated. This raised £230. It is hoped that such an event can be held again next year with similar if not better results. Picture left: Sue Winder receiving flowers, presented by Michael Lumby. Picture centre: John Lee (left) welcoming guests and introducing Michael Lumby. Picture right: Ian Ward (left) serves canapés to Lewis Johns.